Italian media reported that security around Pope Benedict XVI has been beefed up following the harsh responses to his remarks on Islam. On Sunday the pope is expected to deliver his weekly sermon from his summer home, and it is still not clear whether he will address the international uproar his comments have stirred. In a speech delivered last week in Germany the pope quoted 14th-century Byzantine emperor Manuel II Paleologus who said: "Show me just what Mohammed brought that was new, and there you will find things only evil and inhuman, such as his command to spread by the sword the faith he preached." Following harsh condemnations from the Muslim world, the Vatican issues a statement saying that the pope is "extremely upset" that Muslims have been offended by some of his words. The new Vatican secretary of state, Cardinal Tarcisio Bertone, said that the pope's position on Islam is unmistakably in line with Vatican teaching that the Church "esteems Muslims, who adore the only God." Turkish Prime Minister Tayyip Erdogan said on Saturday that the pope’s comments were "ugly" and said the pontiff should withdraw them. "The Pope spoke like a politician rather than as a man of religion," Erdogan said. “We cannot accept these statements. The Islamic world cannot accept them. I think these statements cannot be accepted by the Christian and Catholic world either." Hizbullah and Lebanon's top Sunni Muslim religious authority denounced the pope’s remarks, with the militant Shiite Muslim group warning of a global religious schism. The spiritual leader of Lebanon's Sunnis, the Grand Mufti Sheik Mohammed Rashid Kabbani, said the pope's remarks emanated either from "Ignorance and lack of knowledge or were deliberately intended to distort Islam." Italian Prime Minister Romano Prodi said “there should be no controversy; the pope has already explained his true intentions. The religious dialogue and the respect for every religion is a necessity, and religion doesn’t justify violence. Former Italian Prime Minister Silvio Berlusconi said of Benedict XVI: He is a great pope, with great intelligence. Five churches throughout the West Bank were attacked by Palestinians wielding guns and firebombs. In a phone call to The Associated Press, a group calling itself the "Lions of Monotheism" claimed responsibility for those attacks, saying they were carried out to protest the pope's remarks in a speech this week in Germany linking Islam and violence. Later Saturday, four masked gunmen doused the main doors of Nablus' Roman and Greek Catholic churches with lighter fluid, then set them afire. They also opened fire on the buildings, striking both with bullets. In Gaza City, militants opened fire from a car at a Greek Orthodox church, striking the facade. A policeman at the scene said he saw a Mitsubishi escape with armed men inside. Explosive devices were set off at the same Gaza church on Friday, causing minor damage. On Friday night about 2,000 protesters gathered outside the Palestinian parliament building to express their anger at the pope's statement. "This is a new crusade against the Arab Islamic world. It comes in different forms, in cartoons or lectures ... They hate our religion," Ismail Radwan, a local Hamas official, told the rally. 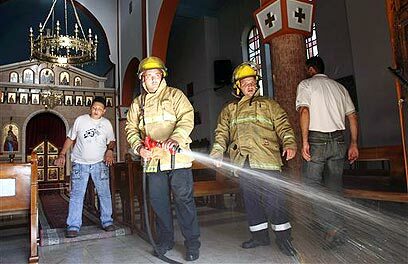 During one rally gunmen in Gaza city opened fire at the Greek Orthodox church; no injuries or damage were reported. An unknown organization named “The sword of Islam claimed responsibility for the incident. “We want to make it clear that if the pope does not appear on TV and apologize for his comments, we will blow up all of Gaza’s churches,” the group said in a statement. See all talkbacks "Security around pope beefed up"